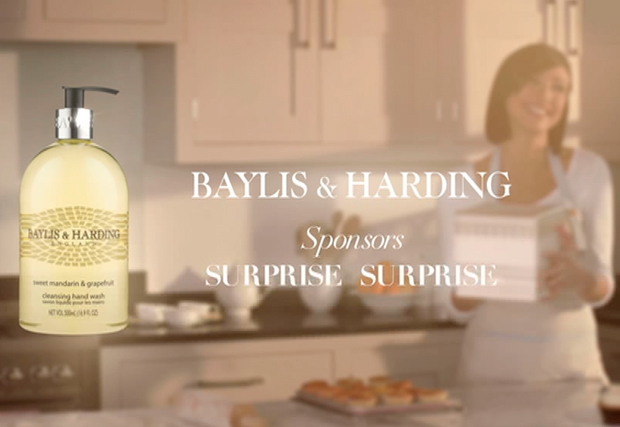 Baylis & Harding is to sponsor the revamped Holly Willoughby-fronted 'Surprise Surprise' on ITV1, in the cosmetics brand's first TV advertising. ‘Surprise Surprise’ starts on Sunday (21 October) and over its six-week run Baylis & Harding will use four different idents using the same characters to draw on the theme of ‘Loving Life’s Little Surprises’. The show - which reunites families - is returning after a 11-year hiatus. The series originally aired between 1984 and 1997 and was hosted by Cilla Black. An annual special was broadcast until 2001. The sponsorship was negotiated by John Ayling & Associates and the idents were produced by Jack Creative Production, directed by Tom Bryant and written by Ed Pettit. All four creatives star a woman called Chloe and various members of her family; in one her friends eat all her cakes but make it up to her by leaving behind a gift set of Baylis & Harding, while another shows Chloe’s husband sneaking into her bath of Baylis & Harding bubbles. Baylis & Harding will support the sponsorship through other marketing and PR to promote its new Beautycology range, which launches in time for Christmas. Tania Fossey, creative director and co-owner of Baylis & Harding, said: "We have wanted to advertise on TV for some time and felt this was the ideal opportunity to take that first step. "We all grew up loving ‘Surprise Surprise’ and the warmth and emotion of this 'feel-good’ programme is a great reflection of our own brand ideals. Our wide range of products has appeal across the board with both young and old and the audience statistics seemed a great fit with our own. "If that wasn’t enough, the timing of the show means we will be front of mind for people who are pulling together their Christmas lists." ‘Surprise Surprise’ aims to give members of the public the biggest surprise of their lives by fulfilling their long-held wishes or reuniting them with loved ones.